As you smash the bugs, the narrator will help you count the numbers of bugs you’ve smashed this way. Some kids (and adults, apparently) have a particular fear of bugs. Called insect phobia (entomophobia), it’s one of the most common phobias among kids. Many adult sufferers would act like prisoners in their own homes when they know a particular bug they despise is lingering around the house. One way to overcome fear of bugs is to gradually change our mindset about them. Many people would suggest studying about them and learning their names, but I’d argue that the best advice is to train ourselves to feel a new and more powerful emotion whenever we encounter them. Because a phobia is a learned and irrational fear, we can unlearn or overcome it by exposing ourselves to the things that we fear. This theory is called flooding behavioral therapy, and it can be very effective for most people. Games such as 123 Smash: Bugs! help train kids to face their fears instead of running away from it. It gradually exposes kids to the things they fear in a fun and playful way, and trains them to feel more powerful instead of clinging onto an unpleasant experience they may have had in the past. 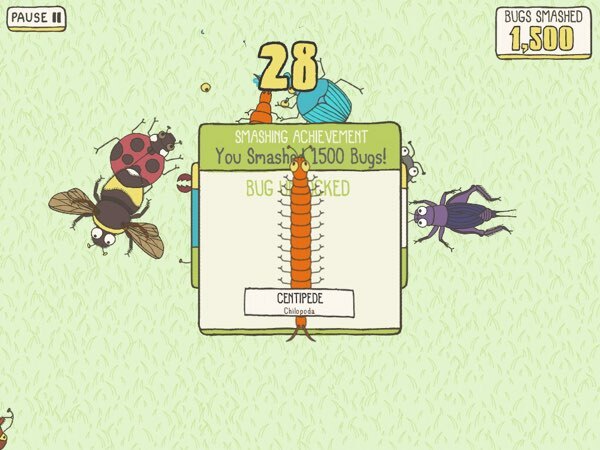 123 Smash: Bugs is more than just a bug smashing game. It also helps kids identify colors and learn to count. The game is structured as an endless series of smashing challenges. On the first challenge, you’re asked to find bugs of a specific color. Kids must demonstrate their ability to identify colors in order to smash the correct bugs. The narrator will keep tally of the numbers of smashed bugs. Kids can reinforce number identification skills, and learn how to count to 30 (and possibly more). The more you play, the more bugs you unlock. I once smashed more than 1,600 bugs in a single seating, and managed to unlock 14 different bugs, including cricket and centipede. In total, there are 22 bugs that you can unlock in this game. All of the unlocked bugs can be viewed in the in-app gallery along with their biological names. 123 Smash: Bugs! is suitable for kids ages 3+ with pretty good finger reflexes. They may need to be more patient when trying to smash some of the fast-moving bugs, such as flies and grasshoppers. These green bugs can fly and hop across the screen really fast. They can also obstruct you when you try to smash other bugs. You can see all the bugs you’ve unlocked in the in-app gallery. While there are other bug-themed games for kids, I’d argue that 123 Smash: Bugs! create a different emotional state for the players. Because the gameplay was designed to keep you focused on repeatedly hitting the correct bugs, you can’t help but feel a bit superior. Even though smashing bugs in real life is never an enjoyable experience, I had a lot of fun smashing bugs on the iPad screen. I’d argue that a flooding behavioral therapy like this can help kids overcome their fear of bugs. There are eight different colors that kids will learn in the app: red, green, blue, yellow, purple, orange, grey, and white. 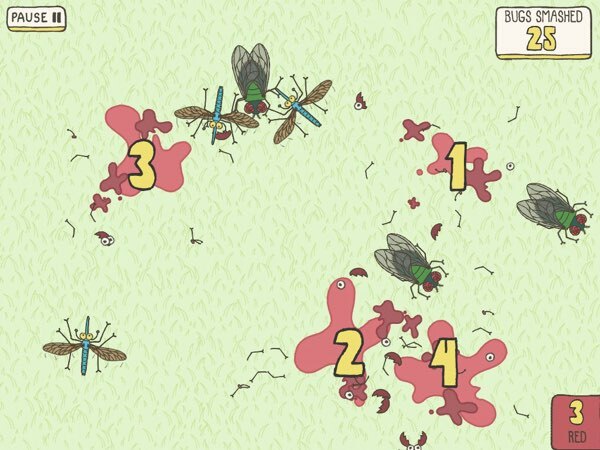 As you progress through the game and unlock more bugs, you’ll find several different ones crawling, flying, and hopping around at the same time. Just be careful not to smash the wrong ones. If you manage to smash a huge number of bugs in a single seating, you might be able to unlock new bugs. 123 Smash: Bugs is a fun game for ages 3+ that doubles as a tool for learning about numbers, colors, and different kinds of bugs. It provides endless, randomly generated challenges so you can come back over and over again. It can also act as a flooding behavioral therapy to help overcome your fear of bugs. My sons and I had a lot of fun smashing bugs in the game.